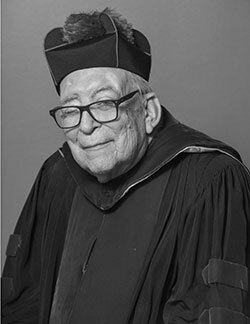 It is with deep sadness that the School of Canon Law announces the unexpected passing of Monsignor Thomas Green, a priest of the Diocese of Bridgeport and the Stephan Kuttner Distinguished Professor of Canon Law at The Catholic University of America. Monsignor Green died peacefully at his home in Philadelphia. A funeral Mass will be celebrated by Most Rev. Frank Caggiano, Bishop of Bridgeport, at Holy Name of Jesus Church in Stratford, Conn., on Wednesday, May 2, at 11 a.m. A memorial Mass is also being planned for early June on the University campus.